A Vickers Vanguard climbs above the Island of Malta. A Vickers Vanguard climbs above the Island of Malta. 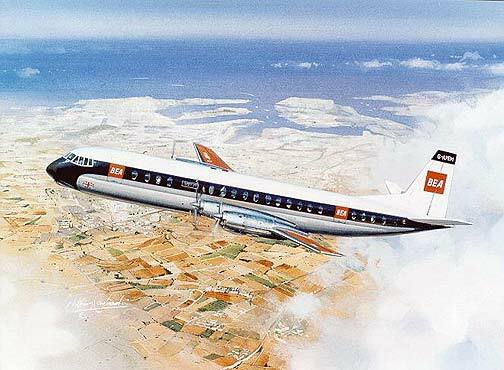 Four Rolls Royce Tyne turbo prop engines powered the Vanguard, which was larger and faster than its predecessor the Viscount. This print is produced as a limited edition of 250 each signed and numbered by the artist Anthony Cowland G.Av.A.